Bloggers Hollow Legs and The Deptford Dame might have beaten us to the bubble tea with their reviews, but Londonist is still intent to share our two fish balls of an opinion about Panda Panda, a newbie “oriental sandwich bar” in Deptford. With a menu inspired by the street food of Hong Kong and Saigon as well as a helping hand from his auntie (of Sandwichist beloved and sadly now closed Baguette + More in Greenwich), owner Van Ie has set out to wow Southeast Londoners (and perhaps the world) with his self-described “Vietnamese style Subway” sandwiches. It's been awhile since Londonist ate at a Subway franchise but as we recollect that experience, we think Van might be underestimating his bánh mì sandwiches. We also think he's onto something deliciously brilliant. During our Wednesday night visit, Panda Panda was slammed with a walk-in request for 29 sarnies. Apparently, some local blokes had mates in town from Birmingham and just had to show off their favourite grub to their friends. The orders were competently (and fairly quickly) filled, allowing Londonist a glimpse at how Panda Panda has been able to build a loyal following since opening less than two months ago as well as at the efficient running of its tiny kitchen. While admiring this popular and speedy operation, Londonist sampled a variety of Panda Panda treats. Everything was reasonably priced, ample and especially tasty. Freshly wrapped summer rolls (£2.95), noodles with grilled pork (£3.45), curry fish ball sticks with chilli sauce (£1.45), mango sago pudding (£2.45) and tofu-fa (£1.95) were all wonderful, as was the refreshing rainbow tea (che ba mau - £2.95) we slurped down. 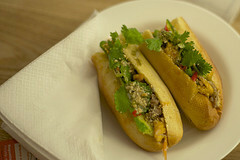 However, Panda Panda's bánh mì are what pleased our palettes the most. Made with freshly baked and crisply toasted baguettes and priced between £2.95 and £3.95, they were as filling and as yummy a meal as we've yet to discover in London. We suspect we'll be back soon for another “A1” (rolled pork and Viet ham with mayo, pate, chilli, carrots, cucumber, coriander, salt and pepper and soya sauce). Although, the “A5” Panda Panda Special (chicken and pork with mayo, chilli, carrots, coriander, spring onion, oil, peanuts and fish sauce) is equally alluring. Panda Panda is located 8 Deptford Broadway (SE8 4PA). Peruse their menu of baguettes, snacks, desserts and range of hot and cold drinks (and have a look at their delightful thumbs-up panda logo) at www.panda-panda.co.uk.